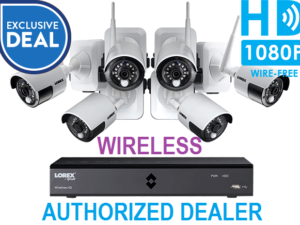 Protect your home or business with confidence by owning this professional surveillance solution from Lorex. 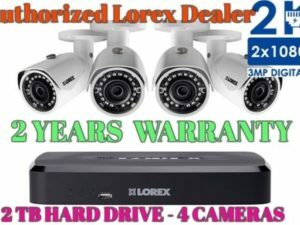 In this bundle, we’ve combined a 2K capable four-channel Network Video Recorder (NVR), two 2K resolution dome cameras, and two 1080p 3x zoom security cameras. Gain that crucial peace-of-mind with the versatility of zoom security cameras and the exceptional video quality of 2K resolution. 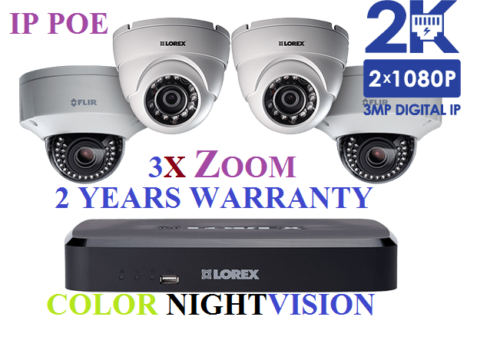 Protect your home or business with confidence by owning this professional surveillance solution from Lorex by FLIR. 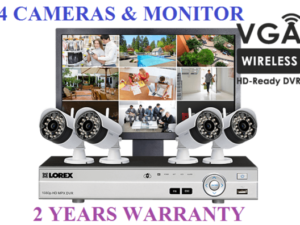 In this bundle, we’ve combined a 2K capable eight-channel Network Video Recorder (NVR), two 2K resolution dome cameras, and two 1080p 3x zoom security cameras. Gain that crucial peace-of-mind with the versatility of zoom security cameras and the exceptional video quality of 2K resolution. HD quality can be the difference you need when identifying important details such as facial features or license plate digits. With 2K and 1080p HD resolutions on your side, you can be confident that you will capture the details you need. The N437VDL security camera includes a versatile 3x optical zoom lens. This handy feature lets you remotely adjust the field of view (FOV) of the camera using your NVR or a connected smart device. Choose anywhere from a 56° narrow-angle (to focus on a small area) to a wider 105° angle (for maximum coverage). 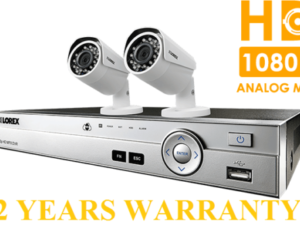 The zoom cameras included in this security camera system are especially useful if “within reach” installations cannot be avoided. They are rated ‘IK10’, meaning that the camera can withstand violent impacts should someone try to damage it. Both sets of cameras come with powerful infrared LEDs that let them see in total darkness. The N437VDL zoom camera even takes its night vision a step further by offering innovative Color Night Vision technology. This means that you can still see the color of clothes or the color of a car throughout the night. * With night vision ranges up to 115ft (LNE3162B) and 100ft (N437VDL), you can be sure that your security cameras won’t ever leave you in the dark. *Please note that ambient light is required for color night vision, in extremely low-light or completely dark settings the camera will switch to black and white infrared mode. Have your security system at your fingertips by connecting your NVR to our free FLIR Cloud app for your smartphone or tablet. 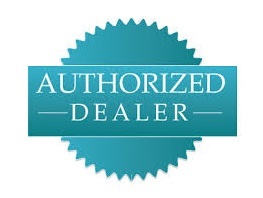 This will allow you to securely access your system no matter where you are in the world (internet access required). See what your cameras see, watch recorded playback, and view easy-to-read lists of motion activity – all from the palm of your hand. Built from a solid unibody metal housing, the LNE3162B and N437VDL allow for durability while still maintaining a lightweight design. The corrosion-resistant aluminum bodies make these cameras perfect for both indoor and outdoor use, protecting them from even the harshest of weather; rain, snow, or hail. Engineered from the same material that is used in construction of airplanes and cars, these Lorex cameras are strong enough to withstand large impacts unlike conventional plastic security cameras. The 1TB security certified hard drive within the NVR can safely store weeks (or even months) of recorded security footage. Engineered for the constant workload required by security monitoring, this HDD can continue to record even while you watch recorded footage. Pre-schedule recording times or adjust the NVR to record at a lower resolution to extend available hard drive space. You can also save storage space by recording only when movement is detected. 1. Real-time recording on 4/8 channels at 1080p (1920×1080) & 720p (1280×720). 3. 4-channel NVR includes 4 built-in PoE ports. 8-channel NVR includes 8 built-in PoE ports. 4. Recording time may vary based on recording resolution & quality, lighting conditions and movement in the scene. 5. The NVR firmware and software must be upgraded to the latest version to use the FLIR Cloud™ service. When the system is connected to the Internet, it will automatically alert you if there is a firmware upgrade available. 6. Requires a high speed internet connection and a router (not included). A minimum upload speed of 2Mbps is required for the best video performance. Up to 2 devices may connect to the system at the same time. The item will be shipped from manufacturer warehouse within 1-4 business day(s). After shipping, items are usually delivered within 1-5 business days.